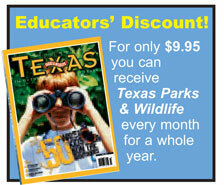 We are excited to present to you "Keep Texas Wild" – a magazine section for kids. Our kid-friendly, four-page sections include fun facts presented with a lively writing style, eye-popping photos and a creative, whimsical design. 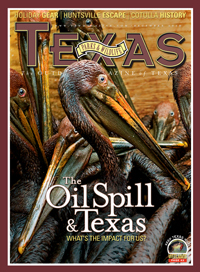 The topics are Texas- specific, with special attention to conservation issues. "Keep Texas Wild" includes hands-on activities that cross the spectrum of curriculum (including art, math, science and social studies) and a call to action that encourages students to get outdoors and get involved. Also, because you are a teacher, you can reserve extra classroom copies of any issue for only $1 each.